I have listened to the voices calling on me to resign my office today. I should spare myself from the difficult path that lies ahead. I cannot in good conscience choose the path that would be easier for me in an effort to duck my responsibility. Do you remember Dr. Tyson? Do you rememberyson ever crying? What abouortham? Did you talk to the governor today? Good evening, everyone. Is there going to be a statement in support tonight? Good night. What’s going on in the state of Virginia? You saw it right there, governor Ralph Northam appearing. Also the attorney general facing those same questions. Justin Fairfax lieutenant governor is facing two accusations of sexual assault. He is hanging in the job right now as well. We’re going to talk about that on our round table with our chief white house correspondent Jonathan Karl, our CEO of democracy for America, Monica Crowley for “The Washington book, as well as Andrew Gillum. He ran for governor in the state of Florida. Welcome to all of you. I mean — Jonathan, a week ago day on Sunday. Then these revelations come out about mark herring and Justin Fairfax. There seems to be safety in numbers. Yeah, absolutely. Because if all three of them go, you have a Republican running Virginia. George, therear national implicationsere. The state of Virginia has voted for the Democrats in tt three presidential elections, a key part of the democratic map for winning the white house, and before that, Republicans dominated Virginia winning every election going back to L.B.J. Now you have a situation where the top 2020 candidates have all called on the democratic governor to resign and for the lieutenant governor to resign, and the real possibility that neither one of them will. No indication eithne of them there. Andrew Gillum, there is no support right now on the political class in Virginia, but I was surprised by this poll in “The Washington post” this morning showing nearly 60% of African-Americans in the state of Virginia think Northam should stay. I tell you this has been a rough week for Virginia politicians, but I have to admit. I just don’t think that we have gotten this right yet as a country. Following trump we didn’t know what to do with those allegations. Kavanaugh, there was not a very clear — yeah. In all these cases. It’s not just race, but also sexual assault, and this is a moment where we have got to start to modeat it looks like. How do you have grace? How do you reckon with what it means to admit what you have done, reconcile that and get on a pathway to improving the community and not making this a very selfish act? We have not been able to see this modeled well I think so far in this country and maybe we can make this a moment frankly across all three of these cases and it will look different for each one to reconcile. I wonder if there is a problem here, Chris Christie, by having all three cases come out together. Is a sexual assault — two sexual assault claims the same as revelations about blackface? I would say no, and I thought of it this way. 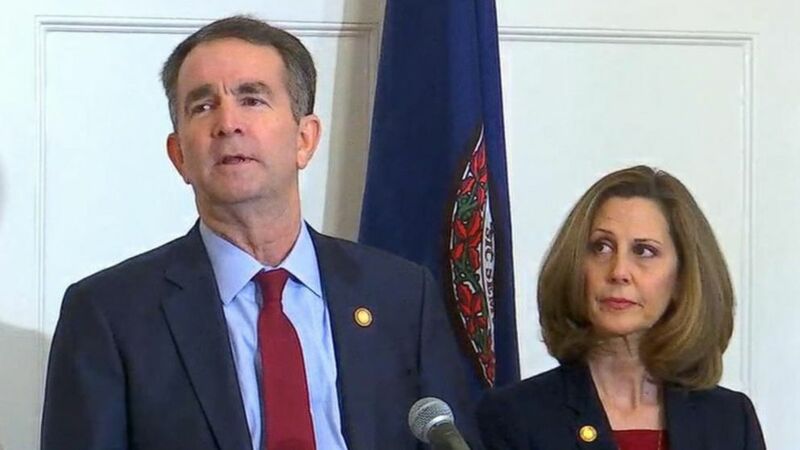 Governor Northam I think is the guy with a huge problem because of the way he handled it, you know, no one in America I think believes that — he thought he was on the page. It was him in the picture and it wasn’t him in the picture and then he doesn’t know how it got there or if he even knew about it before. Nobody believes that. He was obviously struggling because he knows what the truth is and he’s not giving us the truth and I think that’s going to catch up to Northam at some point. Ashe lieutenant governor, now he’s asking for an FBI investigation what Democrats are calling for. There’s a clear appeal to Democrats saying, don’t ask me to resign. You were going to give Kavanaugh an investigation before you asked him to step away from his nomination. I deserve the same things but I think the mayor is right. We don’t know how to deal with this stuff as a country. We’re not dealing with it well, and I don’t know what the statute of limitations on any of this stuff is either. When is it indiscretion? I don’t know if those to that category, but we’re not asking the questions. Big picture, Virginia deserves BETR. They deserve better than racism and sexual assault, and there is a leadership bench right below the top three leaders that is prepared to lead without all the stain of all of these things. You can’t — The Republicans would take over if they all left at the same time. There is a succession plan with timing that allows apparently some appointment that T allow us to keep the leadership in the democratic party. Hat’s possible and there is a way forward for , depending on the timing of the resignations, that respects what Virginia voters wanted in having democratrship, but doesn’t have to have these three tsh — I mean for the points that have been made, no one is accepting responsibility which is a huge isof integrity beyond the allegations at first and you cannot lead with that type of stain. Democrats, virginians deserve better. This is a point I want to make. Democrats at least are calling for accountability and I want to give them a round of applause for that because we don’t see that everywhere. Own up to your mistakes. Step down. Allow new democratic leadership to take the helm. We should be having a national conversation about forgiveness and mercy and grace, but I don’t know if they are a test case with the politics involved going into a 2020 presidential election. I don’t know if that’s going to be the model for that kind of conversation. This is hugely problematic for the Virginia state democratic party, but it’s also hugely problematic for the nasal party as well. Virginia is a swing state and every democratic candidate is going to be asked at nauseam about that blackface photo. They’re going to have to answer that, and all the democratic candidates may, in fact, condemn the photo and Northam, but voters are going to be reminded of this every day from now until election D 2020. The question for the democratic party is are they willing to sacrifice Virginia in 2020 on the altar Ralph Northam? Not just 2020. The reality S a state legislative election this year in Virginia and we’re teeing that up, right? Our organization H been working on flipping Virginia since 2013. We are just a few seats away. We are concerned about the bench below and we want — that’s why we want to resolve this, get these individuals to acknowledge their transgressions, make amends, step out and allow that bench of people of color, of white Progressives who are ready to step up and lead to be able to take the state forward. It seems Ralph Northam isn’t ready to do that, at least not now. You have been a governor. Yep. Can he effectively serve for three years? I don’t think so. Listen. As a governor, your key relationship is with the leadership of legislature, and he’s calling him to step down. If they won’t deal with you, you can’t get bills passed. You can’t get nominations confirmed. You can’t get any of that stuff done. He’s going to have a hard time, but if some Democrats are going to be selfish about this and say, all three of them are going down, and they can’t play the time and game you’re suggesting they play, and a Republican is going to be the governor, they may try to lift this one out. In the end, I go back to the pirtham, you know, weg about the blackface picture, but the other picture is someone with a klu klux Klan hood on. How does he know it’s not him? He doesn’t remember. We can’t see who it is under there, Andrew. Right? And he has to be honest with people and say, you know what? Either it was R it wasn’t. Nobody’s forgetting that they took one of those pictures. Nobody is forgetting that. A sequence has to happen and there has been an acknowledgment. A reading list has been a sign, but we have gotten there. It’s really reconciling what has happened. What exactly are we taking responsibility for? Ly I will say this. Differently than how the other party has managed this in the past, the democratic leadership has stepped up and decried what we have seen ther and demanded that they step down. What is true is none of us get to make that decision. These individuals will, and the people of their states determine what they are willing to tolerate. We saw a second drop with Fairfax with a second accuser coming forward. Now you have got another question for the national and state democratic parties in Virginia which is, is anyone willing to sacrifice the me too movement on the altar of Justin Fairfax? I don’t think anybody is prepared to dilute that movement for him, and in the case of the blackface photo, he has denied that he’s in the photo, but you know enterprising reporters are on that story trying to find both individuals who are in that picture and if you get another shoe dropping, it’s curtains for the democratic party. How do you resign if the person that becomes governor and who has been accused of two cases of sexual assault? ← Speculation Sunday: Is Queen Kamala Behind The Wave Of Hit Pieces On Amy Klobuchar?